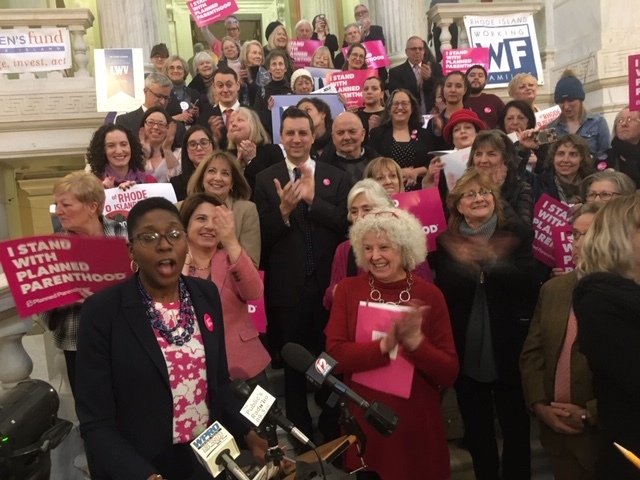 Supporters of codifying the landmark decision Roe v. Wade in Rhode Island law used a Statehouse rally Wednesday to insist that momentum is on their side, but legislative leaders remain non-committal about bringing the bill to a floor vote in the House and Senate this year. Fifty-six of 113 Rhode Island legislators have signed on as cosponsors of the bill introduced by Rep. Edith Ajello and Sen. Gayle Goldin, both Providence Democrats, known as the Reproductive Health Care Act. But although House Speaker Nicholas Mattiello acknowledged, in an interview at The Public’s Radio last year, that a majority of Rhode Islanders support abortion rights. But in a statement Wednesday, Mattiello remained opaque on the outlook for bringing the Ajello-Goldin bill to the House floor. Similarly, Greg Pare, spokesman for Senate President Dominick Ruggerio, said Ruggerio will await a recommendation of the Senate Judiciary Committee. Rep. Anastasia Williams (D-Providence) has introduced a competing bill to codify Roe v. Wade. Supporters of the Ajello-Goldin bill say the Williams bill is too narrow, while opponents of abortion rights say the Ajello-Goldin bill would broaden the definition of abortion in Rhode Island. The abortion rights supporters filled the Statehouse rotunda during an afternoon rally, one day after opponents of abortion rights expressed their view in the same location. Sen. Goldin told the supporters of abortion rights that their activism can yield progress on the issue.